I'm happy to announce the first annual of the 2018 Wet Plate Competition was a great success! There were over 200 submissions from 75 artists in 19 different countries! Myself, along with the judges and sponsors, were thrilled to see such a big response from the wet plate community. When we put this together, our goal was to help bring the community together and provide a platform for recognition to artists working in this wonderful process. And after seeing such amazing work submitted by so many people, I believe we achieved just that. After nearly a month of difficult deliberation from our judges, we're excited to present the winners of this year's competition. We hope you'll also spend time reading each artist's story, and visit their websites to see more of their work. We hope to see you again next year!! I’ve had a life-long fascination with plants of all kinds, and seed pod morphology is particularly fascinating to me. The Aristolochia elegans seed pods are a great example, with their matte black woody hulls. This is not the first time I have used these pods as the subject of a photograph, but this is the first time I have crafted a photo of them I consider to be nearly ideal in style and feel. Only the wet plate collodion process could deliver such a result. 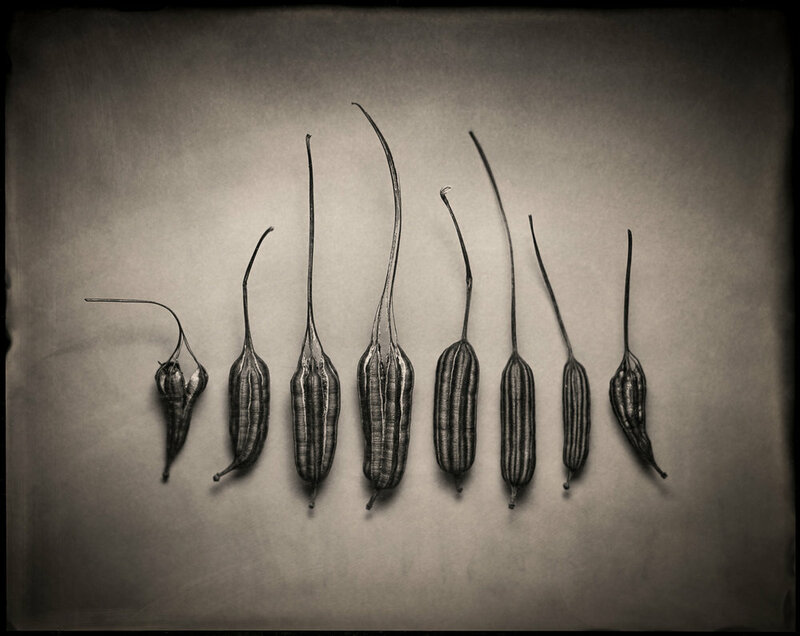 This wet plate image was made in a makeshift studio at my house, simply arranging a selection of seed pods on a dark grey seamless paper backdrop, held on with masking tape. The scene was lit with a compact fluorescent softbox from above, with some reflector fill from below. The compact fluorescents provided enough light to let me expose this scene at f11, using a Schneider Symmar-S 240mm lens. The collodion used in this case was very well aged Old Workhorse. I enjoy doing work on my 22 acre farm near Corvallis because I firmly believe that to do good creative work, you don’t need to leave home and seek out extraordinary sites. Often, there are rich photographic opportunities in your own home if you are willing to see them, and that can be a challenge because familiarity can make you blind to visual treasures that any other photographer might pounce on with excitement. I’m very excited to win the Intrepid Camera and the wet plate supplies! I have long been fascinated with the various ways the red pigmentation in our skin translates to collodion. Slightly under exposing skin tones can have dramatic effects. Pairing this with a high key background really shows off the the signature characteristics of the wet plate collodion process. Naomi was lit with 6’ diffused parabolic umbrella and the background was lit with a zoom reflector from above. 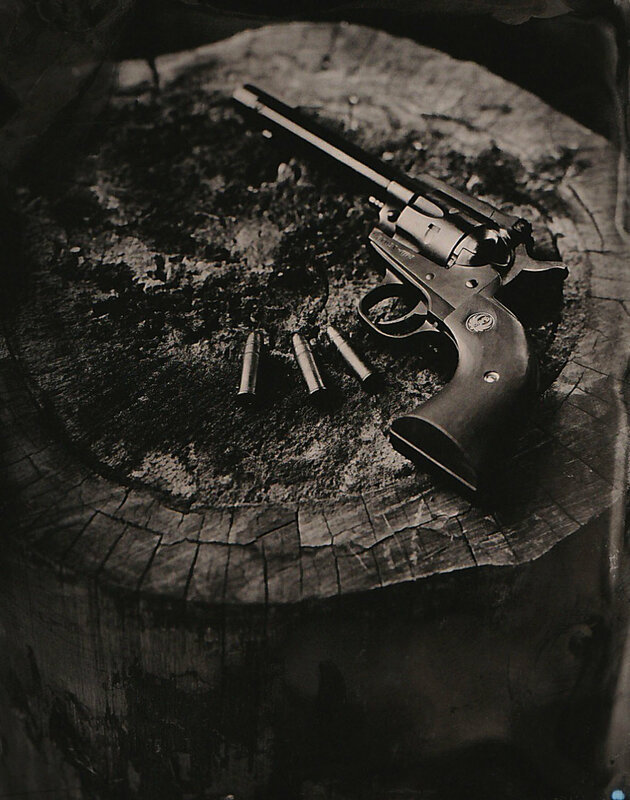 This 8x10” tintype was captured with a Wollensak Vitax No. 5 on an E&HT Anthony 11x14” Studio camera using hand mixed chemistry. I am self-taught and creates my work following the traditions of the 19th century masters. Utilizing chemistry, light, and a little magic, my portraits are able to capture the soul of the sitter preserving them for many generations. In an age of photoshop and manipulation, my images force us to face who we are and to graciously accept it. In addition to portraits, my landscape work connects the present to the past in vivid detail. I learned about Wet Plate in early 2016, I purchased an old Ansco 8x10 camera, found a Dallmeyer lens on eBay, searched for a workshop, and turned an old work trailer into a darkroom. I met Luis when I was looking to photograph another group of people that are close to my heart, "Immigrants". Since I'm a immigrant from Cuba that left because of political reasons, I knew that I wanted to capture the people that cross the border searching for a better life, the people that work the fields, the illegal aliens that take work that no other American would. I want to photograph people that matter, even when they believe they don't matter, people that struggle for a cause, no matter what cause, people that stand up to adversity, the people that makes America work everyday, and are not recognized by their efforts or creativity, just real people. 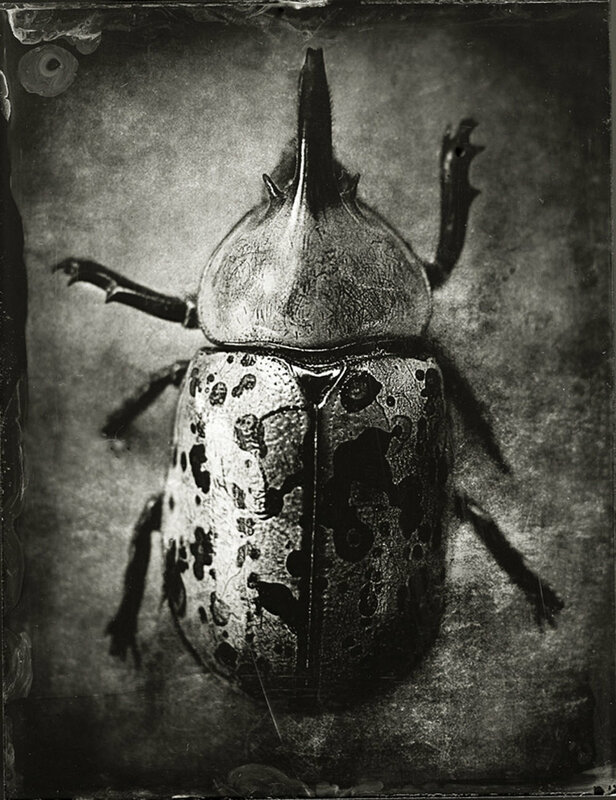 I was working on a project called "Organics", shooting found flora and printing primarily on platinum/palladium, when I came across this little gem: a rhinoceros beetle. He was quite fragile, having been lying in the street for some time before I came along. And what better way to preserve such fragility than through another fragile medium: wet plate collodion. from the wall and it has never been seen since. word – no thief can steal true beauty. 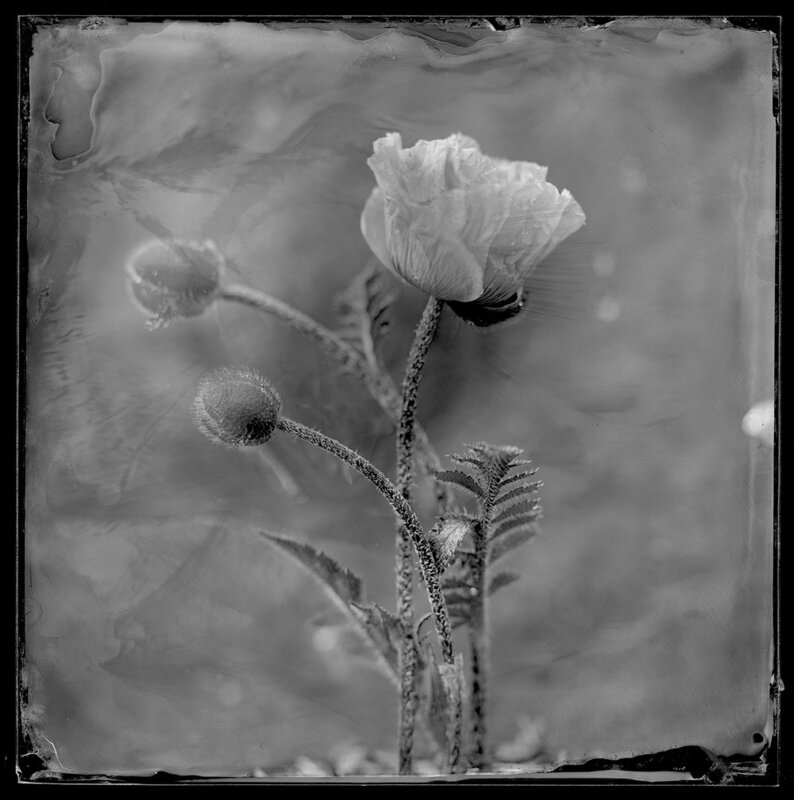 I started making wet plate images in late 2014 and was immediately enthralled with the process. I built my own portable darkboxes which eventually became mounted first on an old Cannondale M300; then to a workmans tricycle equipped with a darkbox that can handle an 8x10 plate. Recently I have made an 8x10 tintype using a pinhole camera made from cardboard box, tape, black paint, and a Coke can aperture. The twilight image was taken during the "Magic 15"; the time that the lights on the Empire State Building were on after sunset but when there was enough blue light to show the background and surrounding buildings. The image was processed in the back of my Chrysler PT Cruiser and transported in a wash tank to my home. This was not the first twilight image but one that I am proud to have done. I continue to push the limits to see what can and cannot be done using what materials I have and am humbled to be selected as a finalist. I am an educator, currently living in San Jose CA, and a full time high school photography teacher, (somewhat ironically) teaching digital photography at my current assignment. I used to be a photojournalist, so I mostly work with people. I do portraits, fashion, nudes, but am starting to make more landscapes. 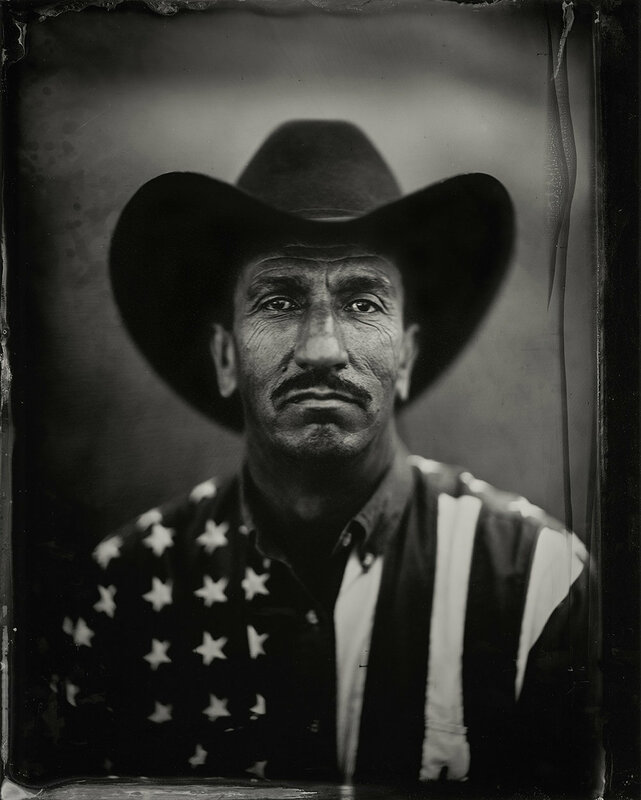 I have been doing wet plate regularly for ten years. 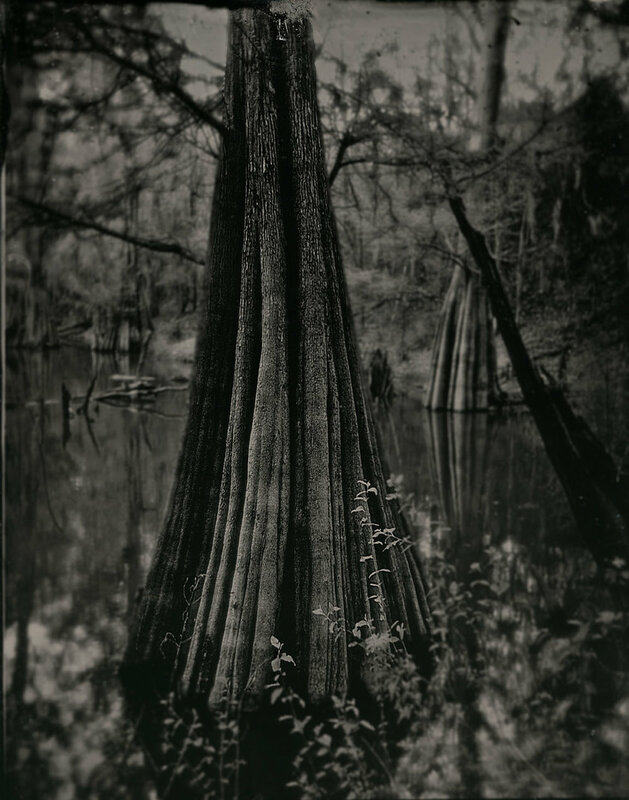 I took a workshop with Joni Sternbach at the ICP in New York in the fall of 2005, then went to John Coffer's Camp Tintype in Summer 2006. This picture was made with a wonderful model who I have worked with many times. She goes by "Youcancallmestormy". It was made on an 8x10" aluminum plate with a Dallmeyer 3b lens. Lighting is two Speedotron Black Line heads on full power. The image of Maritza comes from, and represents a larger series of 80 plates of the 53-year old Colombian guerrilla army, FARC, in the early weeks of 2017 before they formally demobilized. The plates were made within various camps in remote areas of the mountainous Andean jungle, that were only accessible by mule. I chose to make this work because the narrative presented in the news is simple, and I wanted to learn about the complex and dynamic motivations of individuals on this side in the Colombian Civil War. 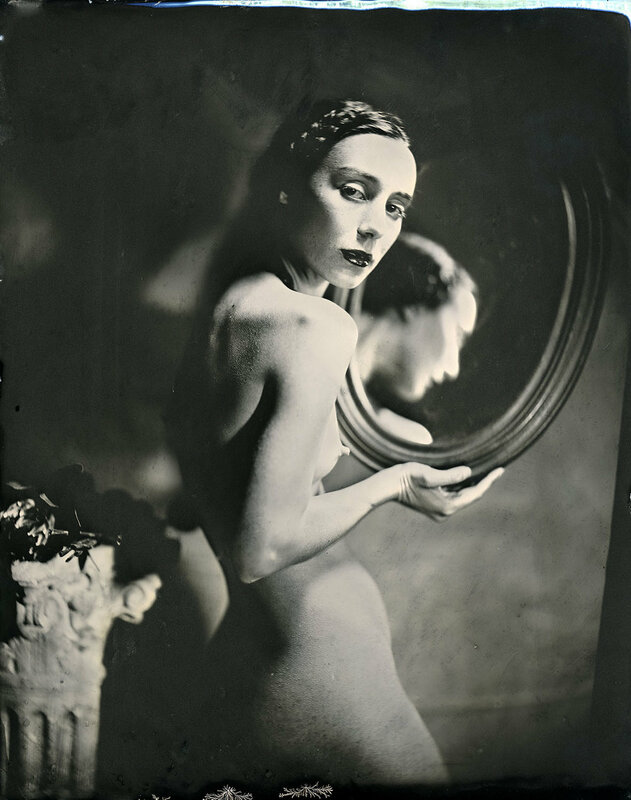 I chose to work with collodion because the process engages the sitter with the photographer, and requires collaboration. Whether securing access, acquiring chemistry in a remote area, or innovating ultra mobile set ups, the series took international coordination between many groups of people in order to happen. Be sure to check out Vela Colectivo, who secured access, and Camilo Sabogal who assisted with acquiring chemicals in Colombia. 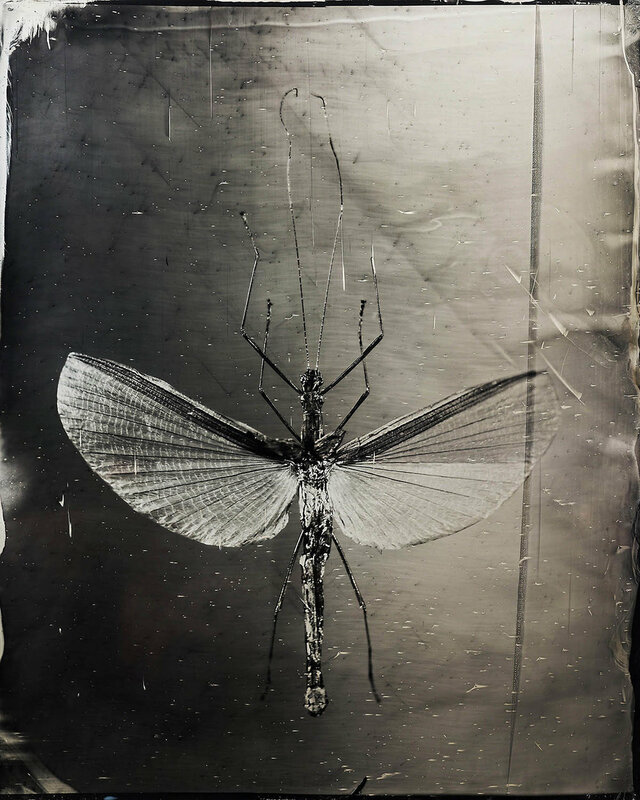 I have been working with the wet collodion technique for 7 years and I can say that this technique has completely changed my life. I have been a photographer for 25 years, from that for 8 years I worked as a photoreporter and for 7 years as theater photographer. 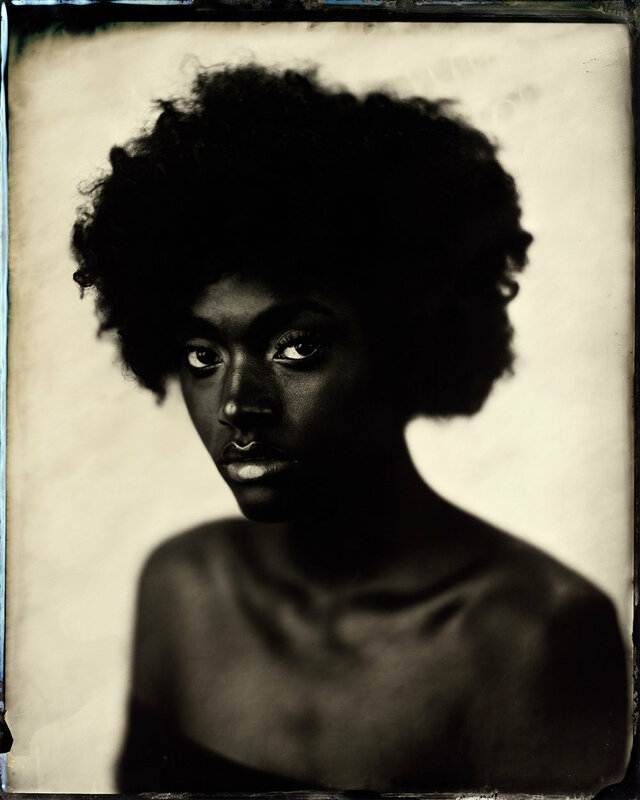 The collodion technique has slowed down my life routine and I have started to perceive my surrounding with different eyes. Everything slows down as I really have to think what and when I take the picture. My Press Freedom photo became very actual in Slovakia, because a couple weeks back a young journalist was killed, so I thought that I fold a bird out of newspaper which is placed in a cage. Even though the bird is surrounded with bars and on the other hand the door is open, the bird stays on its place and continue the job he has started. He could fly out and choose another lifestyle, but he would lie to himself. I stumbled through making my first tintype in 2008 and have been pretty active in the process ever since. 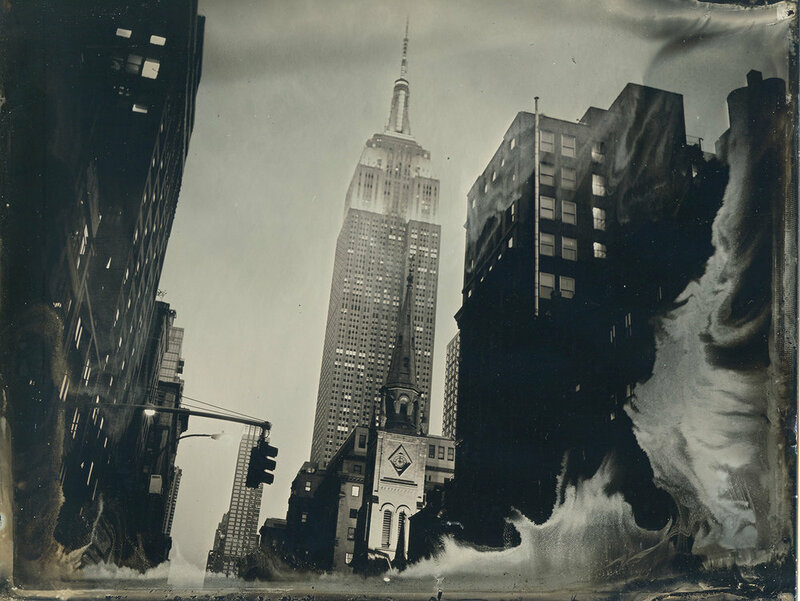 Alternative process photography has been a mainstay for me since about 2002. This 12-plate image is a part of a much bigger body of work. The series is titled “Windows” (clever, I know, heh). The series is of downtown cityscapes of Austin, TX where I live. The series was not particularly motivated by any conscious philosophical drive/meaning for me...but as I worked on it I did find that it connected with a part of me that–generally speaking–sees the world, people, etc. as being multifaceted with parts that are skewed and irregular but that make up a bigger and greater sum. The process of creating them is sometimes a day(s) long procedure depending on the size. Each of the pieces always has a row of level plates and then the proceeding vertical columns are done by simply tilting the camera up and/or down. I find that longer lenses work better for obvious reasons as they serve to compress the field of view. Pretty much the entire series was shot with 16in, 18”, and 30” Goerz Red Dot Artars on either 8x10 or 11x14.